At the CP+ show in Yokohama Japan this week Canon were showing their brand new 11-24mm f4/L USM lens. It is a super wide-angle zoom featuring an advanced optical design and constant f/4 maximum aperture. The red ring on the barrel denotes it is a L-series lens and it works with full-frame EOS DSLRs as well as APS-C-sized sensors (where it will provide a 17.6-38.4mm equivalent focal length range). The lens features one Super UD element and one UD element that said to offer a significant reduction in chromatic aberrations. Four aspherical elements help to minimize distortions throughout the zoom range. Canon claims consistent edge-to-edge sharpness and illumination. A ring-type Ultrasonic Motor offers fast, smooth and near-silent autofocus with Canon DSLRs and should also work well with Dual Pixel CMOS AF on the C series as well. There is also full manual focus operation and an internal focusing design. The lens is both water and dust-resistant. Fluorine coatings have also been applied to the front and rear elements to protect against fingerprints and smudges. The 11-24mm focal range with prove to be very popular with landscape, wedding and architecture photographers. For sports photography you will be able to get some truly awesome wide stadium and arena shots. For the video shooter using this lens on a Canon 5D or Sony a7 this lens will give amazing wide results but beware of the bulbous front lens element. It prohibits the use of standard threaded front filters such a variable ND. Hopefully third party manufacturers will come up with a solution – Fotodiox make an adapter for Nikon’s 14-24mm that allows it to take ND filters so maybe they will come up with something similar. 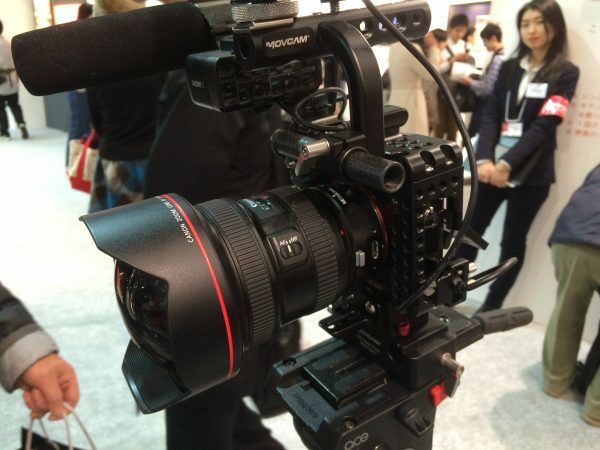 For Canon C100/300/500 owners this lens becomes the full-frame equivalent of a 17.6-38.4mm. You would probably be better off buying the new Tokina 11-20mm f2.8 instead. Oddly enough it seems Sony FS7/FS700/FS100 owners could potentially benefit more from this lens if used in combination with a Metabones Speedbooster. Assuming that it works (we haven’t of course had a chance to test) you should get a pretty extreme wide angles and a faster aperture. Canon graciously allowed me to put the lens onto my Sony a7S but I was not allowed to record any vision as it was still a pre-production version. To use the lens on the a7S you would need to put it on a late model EF to E-mount Metabones adapter. You could also use a Speedbooster but the camera would have to be set in APS-C mode. On a Canon 5D the image showed nice edge to edge sharpness but like any super wide lens you will get distortion in the corners of the frame, particularly at 11mm. At $2999 US this lens certainly isn’t cheap. But if you want the ultimate full-frame ultra-wide zoom this has to be a prime contender.